It depends on how much you massage and how much pressure you place. In general, I don't recommend it to my patients only because I don't feel patients know when to stop and when is too much. Instead, I recommend patients to use ice for 5 minutes at time for several times for up to 3 days. In some cases, depending on the placement of the product, it does help to message the face. Messaging the face will not help with swelling, but may help to reposition the product after injection. The best course of action is to share your concerns with your injector and determine how to address your issues from there. I had Juvederm injections done today, can I take Benadryl tonight? Does Juvederm work on upper lip wrinkles? 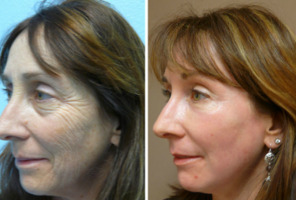 Do Juvederm injections work on deep upper lip wrinkles? I used Juvederm under the eyes to lessen the hollows, and now I have bruises and my under-eye is lumpy, what should I do? Will my eyes stay lumpy or is this just a normal side effect? Please advise. What is the average cost and duration of Juvederm? What is the average cost of a Juvederm treatment? How long does Juvederm last when injected? How long does Juvederm XL last? I work out a lot and my body is in good shape, but my face looks tired. Is there a treatment that refreshes the face? Problem areas are smile lines and brow furrows. Will Juvederm XL work for me? Can you use Juvederm and Botox while pregnant? Can you use this during pregnancy or nursing? If not are there any safe alternatives to treat wrinkles?